The eighth edition of In Search of the Divine features artists whose work is displayed at Carondelet Village (a St. Paul, Minnesota residence for older adults including many of the Sisters of St. Joseph of Carondelet). Artist interviews include Fine Art Tile Maker Sheryl Tuorila; Painter Fredrick Somers; Woodturner Bob Clague; and Master Weaver Wilbur Quespe Huaman, (Agatha Grossman, CSJ, interpreter) with Melanie Ebertz, owner Art Andes. 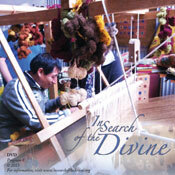 The following are brief clips from episode #8 of In Search of the Divine.